Oh we are getting geared up for Create with Connie and Mary Spring Collection and there are soooo many wonderful things waiting for you in the Occasions Mini and SAB Brochure so our Spring Collection is filled with so many wonderful ideas! I love two step stamping and this set just gives you such wonderful flowers and they look beautiful paired with the Painted Blooms dsp. Blue flowers print (Painted Blooms dsp) – 1 1/2 x 4 1/4, add to card front. 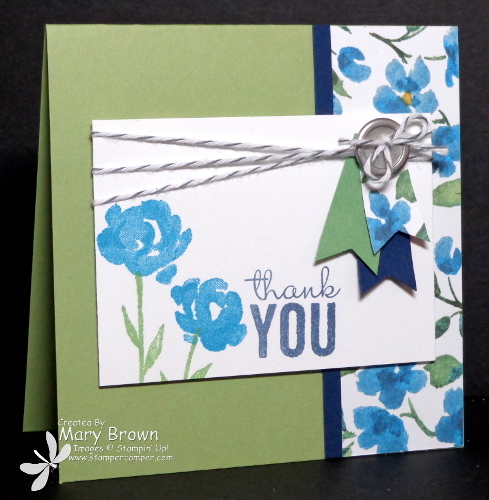 Add twine bow to Basic Silver Button and add to card front using dimensionals. Oh I love how you left one of your panels plain. It really sets off the beauty of the paper. I am loving both the paper, and the stamps. Beautiful card Mary. Love this card…can’t wait to CASE it. Oh these blooms look beautiful in these (my favorite!) colors! I love how your stamped flowers look just like the dsp!! I guess I’m going to have to get that set!! Pretty colors and pretty flowers! Love this!! Gorgeous!! I love this new stamp set and paper, the blue is so beautiful! Beautiful! The stamped image balances the DSP nicely – very pretty!